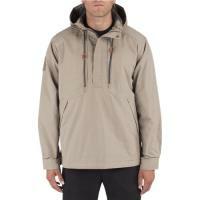 511 Tactical Taclite Anorak Jacket (78012) FREE SHIPPING! The Taclite Anorak Jacket from 511 Tactical is a highly effective weather-resistant pullover outer layer, designed with comfort and tactical functionality in mind. Its lightweight but tough Taclite exterior is backed by a soft, breathable cotton twill lining, and 40 gram insulation through the body and sleeves improves heat retention in cold weather. The Quixip zippered side vents feature high-quality YKK hardware and can be used to improve ventilation when needed, while the RAPIDraw kangaroo pass-through pocket features snaps that pop open with a single pull for rapid access to a concealed firearm. The adjustable cuffs fit snugly at the wrist, improving insulation and preventing the fabric from getting in the way during delicate tasks, while the adjustable hood and storm collar protect the face against wind and rain. ©2002-2019 CopsPlus.com: 511 Tactical Taclite Anorak Jacket (78012) FREE SHIPPING!